James Coplan, M.D., Neurodevelopmental Pediatrician, Author and Speaker » Blog Archive » Beyond Kanner and Asperger – Part 2. Beyond Kanner and Asperger – Part 2. 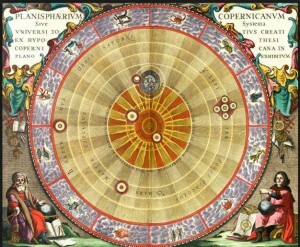 Copernicus’ heliocentric model of the solar system. The sun is at the center; the earth and other planets orbit around the sun. Ever since Kanner’s 1943 paper, clinicians have been arguing about how atypical is “atypical enough” to qualify for an autism diagnosis. Diagnosing ASD in a child with moderate to severe atypicality generally is not a problem. Problems arise, however, when considering adults, and/or persons with mild atypicality. There are a couple of reasons for this. First, Leo Kanner’s ghost – with its insistence that autism is both rare and severe – continues to roam the halls of the American Psychiatric Association. Thus, DSM5 clings to a fictitious boundary between “Normal” and “Abnormal,” and emphatically rejects the concepts of “compensated” or “subclinical” ASD. In the view of DSM5, treatments merely “mask” symptoms, and in order to qualify for an autism diagnosis an individual must remain “significantly impaired.” At a deeper level, however, there is another problem: ironically, autism experts have a tendency to over-focus on atypicality in isolation, and miss the forest for the trees. Paradoxically, taking autism out of the middle of the picture will actually let us think more clearly about ASD – just as taking earth out of the center of the solar system enables us to think more clearly about astronomy. All the spheres revolve about the sun as their midpoint, and therefore the sun is the center of the universe. What appear to us as motions of the sun arise not from motion of the sun, but from the motion of the earth…which revolve(s) about the sun like any other planet. These and a few additional basic principles formed the foundation for all that followed. Atypicality (i.e., “autistic behavior”) exists in various degrees, from profound to minimal. Taken individually, most of these principles are not new. What is new is the way I’ve put them together. Specifically, what I propose is a frame of reference that simultaneously takes into account the degree of atypicality, level of general intelligence, and age (or, Time). These variables form the axes of a 3D graph, on which we can plot the location and progress of a person with ASD over time. As I will explain, atypicality forms one axis of the graph, but atypicality is not situated at the center of the picture. Just as Copernicus enhanced our understanding of the heavens by taking earth out of the center, I submit that we will have a clearer view of what’s going on with persons with ASD by moving atypicality out of the center of the discussion, and placing it within a broader context.